A little over a month from now, Mega Man Legacy Collection will be arriving on the 3DS; bringing all six original Mega Man games to the platform in a remastered bundle, with some extra features thrown in for good measure. While it may seem a bit redundant given how all six are already available to be purchased separately on the eShop, it's nonetheless nice to see Capcom showing the Blue Bomber some much needed attention. In addition to this, it seems that there'll be an eye-catching piece of Mega Man merchandise being made available in the near future. 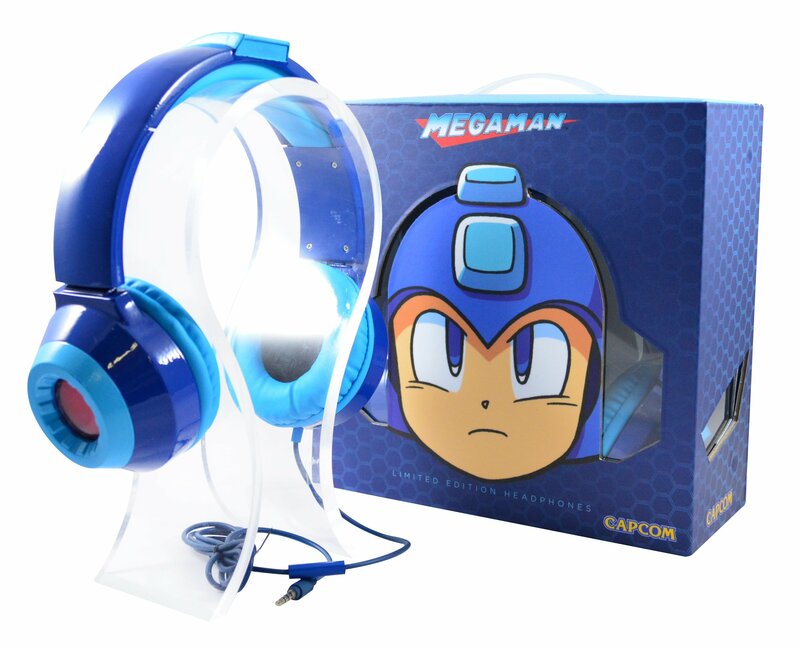 The official Mega Man headphones are available for pre-order here, and will no doubt make for an excellent addition to any collector's stockpile of Mega Man themed goods. The headphones feature LED lights on either side, though there aren't any audio specs listed that give an indication of the quality of the sound. Hopefully they're pretty decent, as you'll have to shell out $99.99 for a pair. Also, it seems that they're only shipping to the United States, but hopefully that'll open up more in the future. What do you think? Would you be interested in picking these up? Will you be getting the Mega Man Legacy Collection? Drop us a comment in the section below. O_O I would love those!! Not for the price, but ahhh, they look so cool! I guess you can call yourself... Rockman! Their headphones average about 3.5/5 on Amazon, most say the sound and comfort are good, but they break easily. All of their headphones cost around $25, but for some reason, the Mega Man set costs 4x more, I know it has LED, but 4x more? They also have other licensed products too like various Harvest Moon headphones and a Darkstalkers Felicia headphone. Um, no. That is waaaayyy too much for this brand. As much as I'd love to own these things (mostly because I think they're funny), the most they'd be worth if you stripped off the Mega Man aesthetic is like $30. Disappointing. As much as I would love to get these, I won't get them. They look fun to have as a novelty item I suppose, but if I'm buying headphones for $100 I'm going to aim for a quality, sturdy product and I just don't trust these. Looks awesome though. Oh, they look cool, many Mega Man fans'll got it! Really cool and really overpriced. Dang! Would grab a pair if they weren't so expensive and only limited to the states. Darn it. I just paid $99.99 for a pair of Beats a day before I saw this article. I would have totally waited to buy these instead. Still, I wonder if they are good for just listening to Rock? Wow, $100, no thanks, heh. I mean, if they turn out to have quality sound that actually deserves that price, then great news for the audiophile-megaman subset. I'm sure they'll be happy. Personally I don't think you should worry about the sound or build quality of these headphones. They're more of a fashion accessory to get beaten up in. Those look awesome, but who has 100 bucks or headphones? Then again people are able to afford those 200 dollar action figures. Sometimes I wish I was a rich geek. Ahhhhh I want 'em so badly but ahhhhh it's a hundred bucks so it's worth but it's also not worth it. If it was just for the fashion, I say buy some blue earmuffs and call it a day. I would love to have these! But not for 100 dollars. @NTELLIGENTMAN Wouldn't that be somthing? Rock music sounding good on Rock man headphones. Rockman rocking out to rock music? Wow.... Think I'm gonna order these right away! Can I use these to play an official new Mega Man game? Make it earphones that are Mega Man or Proto Mas helmet on the other hand.. I neeeeeeed these but not for that price! Hopefully they don't do too hot and go cheap or get in a amazon lightning deal or something. I'd do around $40 for these, but not $100. I actually need a good pair of headphones that are sturdy and won't break. That would be great if these were built to last but unfortunately it doesn't look to be that way. That's a shame, I would gladly put down the money for it. Also, that headphone jack needs to be the curved type that can plug into the 3DS or a music player while in your pocket without bending the jack connector. Nothing like having to get a new set because the wire got bent to much and lost sound in one ear. @NTELLIGENTMAN They are about the same quality as BEATS so yeah, return those and get this awesome headphones. Or you can check out Vmoda headphones. I bought mine two years ago, use them almost everyday and they still look brand new and sound incredible. @evosteevo Check out Vmoda headphones. They are incredible. It better be able to listen to secret government radio conversations. @GunplaGamer Thanks for the reference! This is the first time I've ever heard of Vmoda. I like the custom shield aspect and the warranty is probably the kicker that will have me buying a set of these. For pricy headphones, I really need that reassurance that they will deliver and last the test of time. @evosteevo Yeah My sister was the one who turned me onto V-Moda headphones as she has the smaller ones. Mine I LOVE and I also use them for gaming with the $30 mic that is AMAZING, and it allows for such a clear voice. They are totally worth the price tag. It also comes with a REALLY nice zippered headphone case that they are shipped. I cannot recommend them enough. I also have glasses and they are still so comfy lol. Also you can customize them down the road with new shields. Commence the whining about there being no new game in 1....2....3....! I went ahead and "pre-ordered" these headphones as a gift for my husband. Now here is the problem, it's been a week after emailing the website several times I have not received an email confirming my pre-order purchase or any email what's so ever. They have already changed me thought. I've never bought from this site before but I took a chance since it was officially been announced here as legit. This is really shady. I don't know if I should report it as fraud. Doesn't appear to have bluetooth support. The headphone jack would get broken in no time in my hands. My wife got me these as a gift for Valentine's Day. I was stoked when I opened the box... Until I actually held them in my hands. Most cheaply made headphones I have ever seen, paint was crossing lines and was scratching off, you could see obvious defects in the plastic, etc. And they sound worse than they look, my iPhone earbuds ran circles around them. It was incredibly sweet for my wife to get these for me, but I had to send them back. I'm not an expert in audio equipment, but I wouldn't pay $20 for those things, let alone $100. Its Capcom and Emio trying to pull a fast one on collectors. Shame. We got hold of this gadget and our team wrote a review. These are merely for possessive value, not to be worn. IOW, collector's item. Besides, it doesn't even have bluetooth.